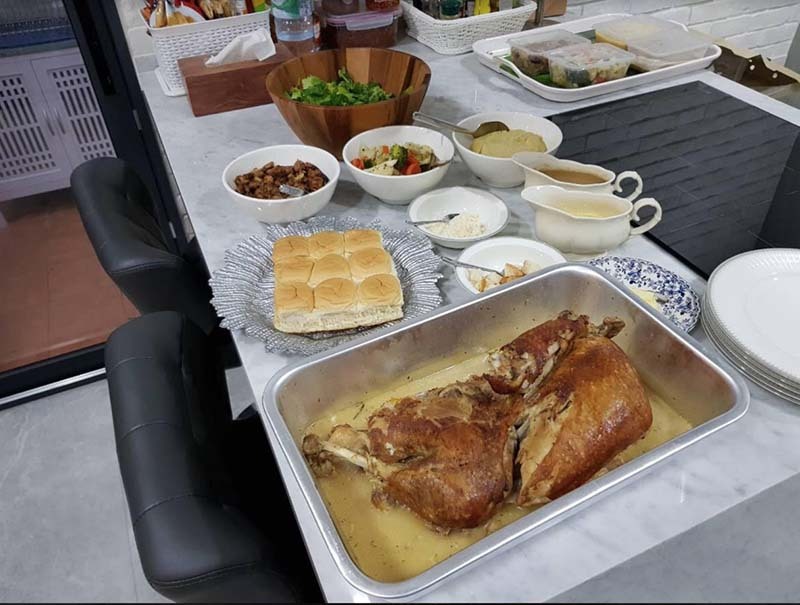 We can deliver your hot oven roasted turkey and sides anywhere and anytime in Bangkok for a fee between 250 – 500 baht depending on location. You can also pick it up at a designated time at one of our restaurants. Let us make your holiday dinner with turkey a huge success. 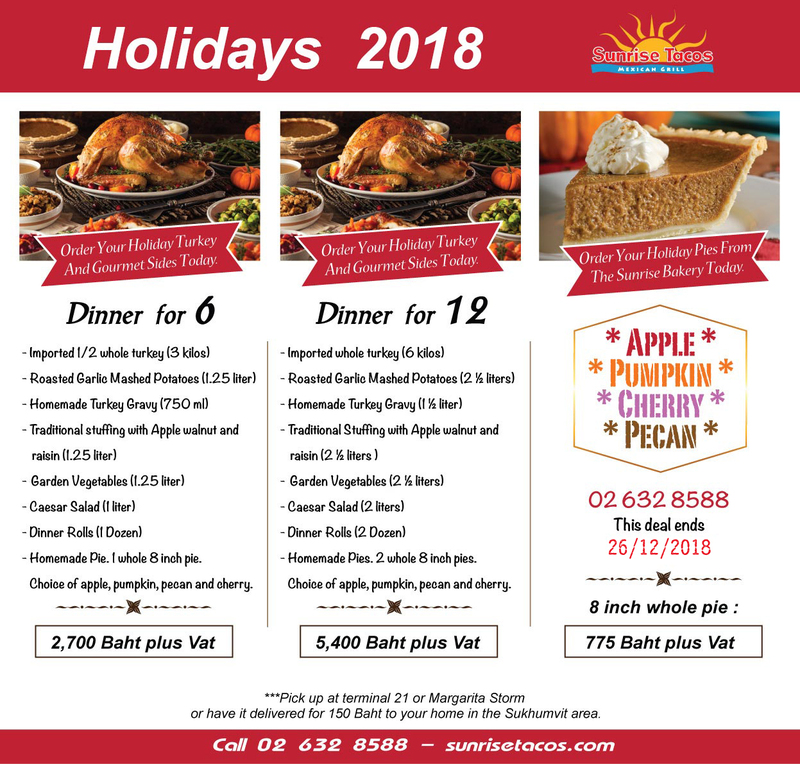 Over the years we have delivered hundreds and hundreds of hot oven baked imported turkeys with all the traditional hot and cold sides along with our famous homemade pies to homes in Bangkok. 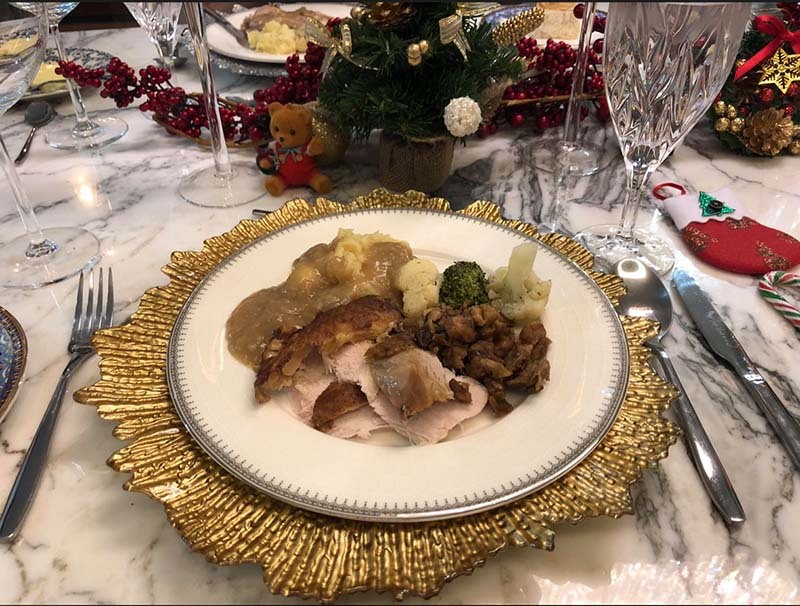 Please see below small sampling of unsolicited comments from guests in Bangkok last year, they were very appreciative of having a prepared turkey and traditional sides for family and friends and wanted our team know that it was a big hit at their party. Let our team do the work and you relax and enjoy the time with family and friends. That’s been our goal every year for the last ten years. We do the work and you get the accolades from your guest. In Thailand, because of an embargo on imported turkeys, in the supermarkets you will find either no turkeys or almost always just Thai turkeys. It is important to note the shape of the Thai turkey is different and more lean than the traditional shape of Western turkeys. As a result the breast meat of Thai turkeys has a smaller yield of white meat with larger yield of dark meat from the thigh and leg area. It also has a net lower yield of pure meat. 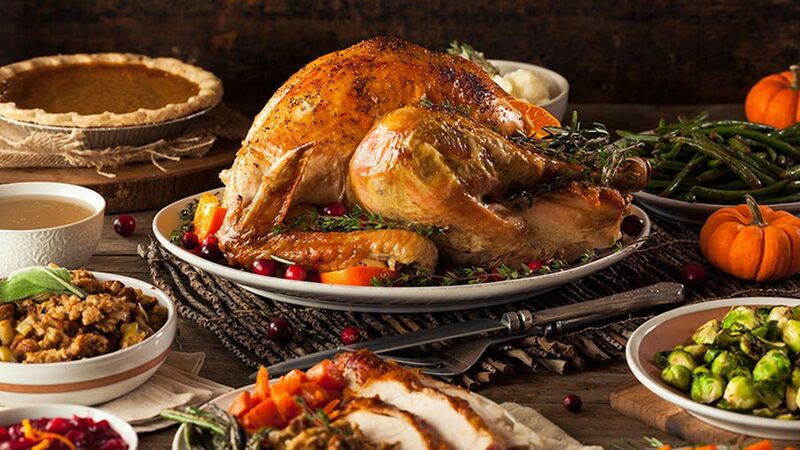 In all a Thai 6 kilo turkey will yield usually around 1.5kg of meat which will feed 6 people each 250 grams of meat, of that 70% will be dark meat. The price for a uncooked Thai turkey at Villa is 475 Baht a kilo and 600 Baht a kilo for a fully cooked whole roasted turkey. 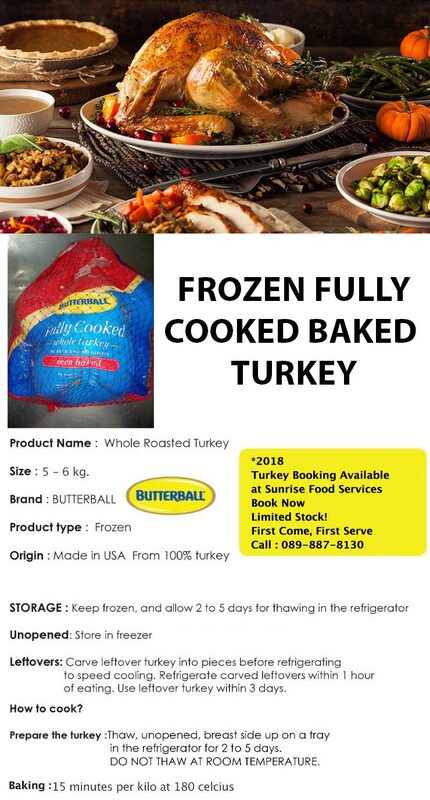 We offer the option of buying an imported fully cooked whole roasted Butterball turkey for a lower price of 415 a kilo plus VAT and it can be delivered to your door or pick up at Terminal 21 Sunrise location. The price for this imported turkey if you like to oven roast it yourself can be found Here. A western turkey has a larger breast area and the harvested weight of a 6 kilo turkey will yield 3 kgs of meat and provide 12 people each around 250 grams of 60% white and 40% dark meat. As previously mentioned, Thailand has an embargo on raw turkey being imported. Hence our buyers have been working hard since last year sourcing all options to import Western turkey; it has a higher percentage of white meat and higher yield of meat for our clients. If the turkey is slow roasted before it is shipped then frozen and sent to Thailand it has no import restrictions. In fact as it is par roasted, the yield of meat is even greater than a normal raw turkey. The price for this imported turkey if you like to oven roast it yourself can be found Here. Six and twelve person feast unsolicited comments. My boss is very happy with your food and service, thanks a lot. Just a quick email to let you know everything was super with the delivery and food preparation of our Christmas turkey dinner. Thank you to you and your team for their respective inputs and we will have no hesitation to recommend your service to our friends. The turkey feast was delicious. Thanks so much! I wanted to let you know that the dinner was great! everyone enjoyed it and the quantity was a lot! The cherry pie was great and turkey was yummy! We received the Christmas turkey dinner set on time and quite enjoyed the food. Thank you for the good service. We will definitely recommend your service to friends our turkey (as on Thanksgiving Day) arrived on time, hot, with lots of juices. It was tender and moist and our turkey lovers were so pleased! Thanks for being reliable and efficient. May your business prosper in 2019!! Just a quick note to thank you for a wonderful turkey dinner. Everything I ordered was delicious and it was a special treat to end the meal with your yummy apple pie. Our turkey dinner today was wonderful! We really enjoyed it all - thank you! I had the turkey dinner from Sunrise Tacos, the bread rolls were great. The mashed potatoes and vegetables were good too. The stuffing matched well with the turkey. The salad dressing could have been better, but I’m used to the good salads at Sunrise Tacos. That was the only part that wasn't amazing. The turkey was easy to pull off and juicy. Very good. The pie was absolutely great. The food was delivered nice and hot. I had heard about the Sunrise Tacos dinner from a friend who ordered it for the 25th. I think it was a good value for the money and I will recommend it to others who don’t want to pay buffet prices, and want leftovers for the next few days. I have ordered the 12 person dinner from Sunrise and it was absolutely delicious. 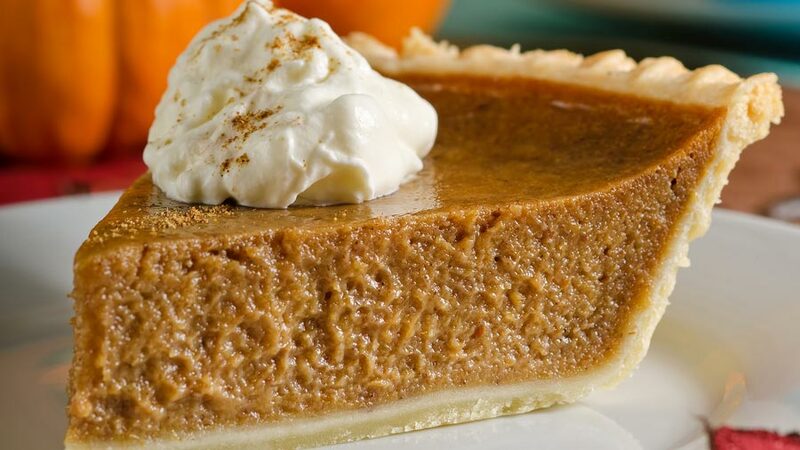 Turkey was not dry, Mashed potatoes were fresh and I think they might actually use real pumpkin in their pumpkin pie ;) We have re ordered for next week once again. Everything was GREAT ! We much appreciated your service. Will send pictures when things get back to normal. We will do this again ! Everything was perfect. The delivery was on time and everything was hot, the turkey, mash potatoes, etc were amazing. Merry Christmas! The turkey was great. Thank you so much. I appreciated the early delivery and everyone loved all the dishes, but especially the turkey and the pecan and pumpkin pies. I might have to order an extra pie next year! Thank you very much. We were extremely pleased with the turkey and service last time. Please find attached proof of payment. We had an amazing pre-christmas dinner at home! The turkey meat was juicy, the skin was crispy. It really was delicious. The mashed potato and pumpkin pie was also very good. Salad was nice and fresh. Thank you so much. Thank you for delivering the delicious meal! The packaging worked great and everyone enjoyed all the dishes. I would definitely order the turkey meal set again and would recommend it to my friends. Here’s a bit of feedback: The delivery man was polite and helpful. He did a good job interacting with me. He arrived quite early (approx 4pm for a delivery window of 5-6 pm), but this may have been because I had changed my delivery time from 4:30 to 5:30. Thankfully I got home right after he arrived, so it worked out fine. I’d rather have too early than too late! The food was all warm still, which was good. I just kept it warm until we had our dinner at 6:00. The amounts of all the foods were perfect. However, if possible, a bit more mashed potatoes would be nice. The potatoes were so yummy that everyone gobbled them up! Everyone got some, but I think a few would have enjoyed having a bit more potatoes. My favorites were the gravy, the turkey, and the potatoes. Thank you for helping us to have an especially delicious thanksgiving feast without the stress of cooking or washing lots of dishes! Please keep me posted about any other special deals you have like this. The Turkeys were an absolute hit, we actually ran out of everything, and I mean everything. We could have easily had another turkey, many many more pies, stuffing, mash potatoes, etc.... Next year I will take your advice and buy all full sets rather then just 1 full set and three turkeys. I really should order next year 5 full sets of turkeys for the 60 people. It was an absolute hit and we really appreciate it. We told many many people about your company, what you offer, and the quality of your other food. I'll upload photos from the event and forward them to you later today. Food arrived on time and it was great. All my guests love it. 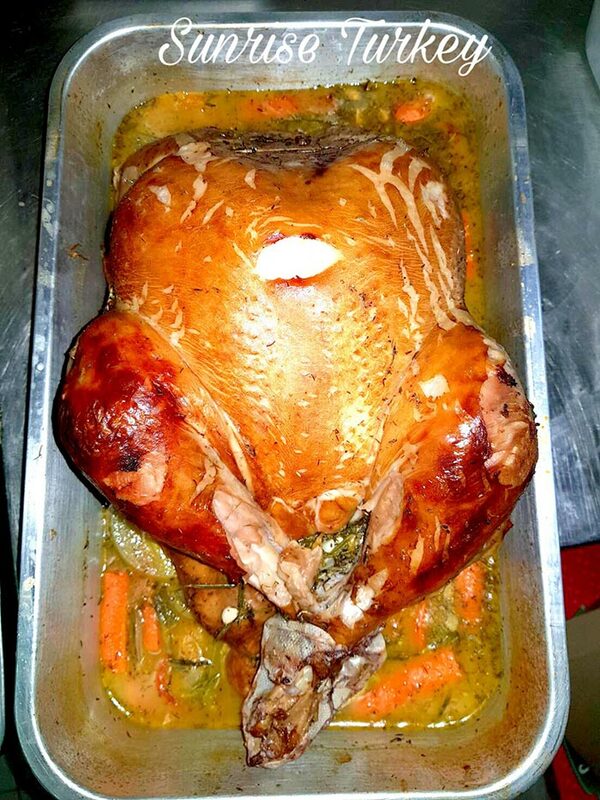 Party went well, and the 2 1/2 turkeys were still hot in the insulated box after 2 hours traveling to Chonburi by taxi. The salad, cranberry sauce and pies was cold as they should of been. Thank you so much to all of you, making my dinner a huge success. I wanted to tell you the turkey was awesome. We had an American friend staying at home this weekend and he was so happy, it was a great tasting turkey. Thank you. I want to write to thank you and tell you how delicious our Thanksgiving turkey dinner was. The Food arrived both hot and cold and the order was just perfect. Turkey was moist (a challenge) Veggies fresh and mash potatoes fantastic. Stuffing was made as requested with no walnuts....we added a little butter.....ok a lot of butter ;) and baked.....perfect. Your pumpkin pie was over the moon good, I have never had a pumpkin pie made with REAL Pumpkin....Fabulous. Tonight is leftover night and we are very looking forward. I will once again order around Xmas and I will post on Bangkok Foodies Facebook etc. The turkey was delicious! We were very happy with your service and we were so grateful to have this option! I have to say I wasn’t sure how a precooked turkey would taste and if it would be over cooked, but it really was tasty and moist. Well done and thanks for offering this option to those of us who really like to have a traditional Thanksgiving Dinner! The turkey dinner set for 6 was excellent! The food was tightly sealed and individually packed. The meal arrived piping hot in a Styrofoam box and was delivered on time all the way out to my area in Pathumtani-Nonthaburi. We loved the pie and will definitely order again! The food was very delicious when it arrived. Just to let you know, all went well and the Turkey was Roasted to Perfection. My guests also gave Thumbs Up on the Cranberry Sauce and Pecan Pie. Looking forward to doing this again in the future. Thank You and your Staff for a Feast Well Done. Your team is so wonderful. My colleagues at work were so surprised. We just finished eating again... can last 2 days for four people. I had a turkey dinner at a friends house yesterday, the quality was exceptional. Looking forward to your reply and btw, I was so impressed with your turkey (and all other food! I’m English and have never ate pumpkin pie before!) I’m going to eat dinner at your mega bangna branch tonight to try Your Mexican!! Your turkey was really delicious. Everyone in the office loved it. Thank you so much. My friends were so surprised and could not believe you actually put together a whole authentic meal and brought it to the hospital. Dante said it smelled like his mom’s kitchen in there. And, they sent a picture – that is a LOT of food! More important, they said it was the best turkey they ever ate. You guys really did an awesome job. Thanks again for all your help and putting it together on short notice. Have a great day, and see you in Bangkok! My friend after he gets out of the hospital would like to visit you to give compliments to your chef and team. I just wanted to let you know that we all really enjoyed your turkey and gravy and stuffing. The turkey was delicious, the packaging and delivery were great - I am very impressed. Thank you again, we had a wonderful Christmas dinner thanks to you. Happy New Year and we will be back next year! Our office loved it by the way, the food was great. Everyone at my dinner party is raving about the food! Love you guys! (I made the bacon wrapped asparagus) Thank you! Our order arrived 30 minutes early. The food is delicious. I could have passed it off as mine! We just finished the meal! It was so delicious! Everyone was so happy and pleased with the food! The delivery guys were great and it just was overall amazing! Just wanted to drop you a quick note to say how very happy we were with the food. The turkey was really enjoyed by everyone. There was loads of food, and everyone went away full and very content. For minor feedback (not a complaint, not a criticism! ), the veggies suffered a bit (but this is not a surprise given the delivery conditions and time), and you might like to think about not dressing the salad (maybe a separate sachet of dressing?). However, please rest assured this is feedback, not complaint. I was really very, very happy, and will look forward to ordering again next year. Thank you very much for the delicious turkeys. We all enjoyed your food very much. The price for a uncooked Thai turkey at Villa is 475 Baht a kilo and 600 Baht a kilo for a fully cooked whole roasted turkey. 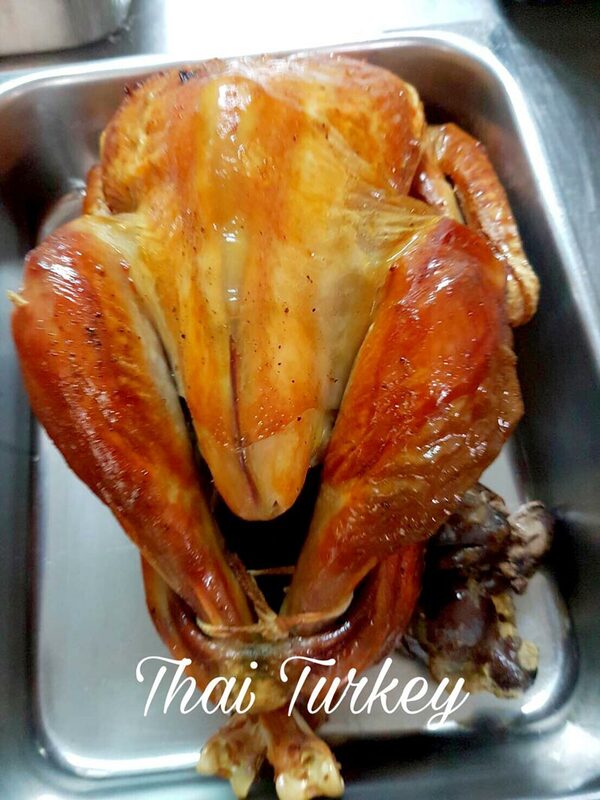 We can deliver anywhere your turkey in Bangkok for a fee of 100 to 200 Baht depending where your home or business is located. Elsewhere in Thailand the delivery fee is 520 Baht and 250 Baht for dry ice and styrofoam box. Delivery normally is within 24 hours outside Bangkok. Inside Bangkok, it is same day or whenever you would like it to be delivered.